Castle, 27 km northwest of Imperial Metals’ Red Chris Mine, has gold-copper porphyry mineralization in Jurassic intrusive rocks of the Stikine Terrane. West Cirque Resources has an option to earn a 100% interest, BRL retaining a 2% NSR. Present exploration is being funded by Freeport-McMoRan, which has an option to earn an interest in the property. The Castle property is located on the Kinaskan Plateau, about I5 kilometres west of the village of Iskut and 30 kilometres west of the Rai Chris porphyry copper-gold deposit. 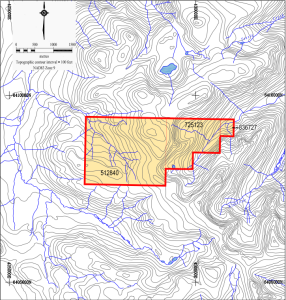 NGEX’s GJ copper-gold porphyry deposit is about 15 kilometres to the south. Historical data indicated that a large epithermal gold system exists on the Castle property with potential for a low-grade, bulk tonnage deposit, along with somewhat less potential for a high-grade vein deposit. The Company had performed some geological ground work on the Castle property during fiscal 2009.